Since 1961, laser research has long been an important part of DST Group activities. Work commenced on the laser at the Weapons Research Establishment in 1961 and it operated the first laser in Australia. 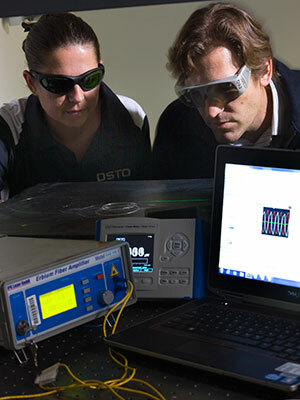 A Laser Group was also established at the Defence Standards Laboratories, Maribyrnong, in 1963. The aim of the group was to become better informed about the phenomenon of lasers and their potential. In a series of world firsts, new carbon dioxide gas lasers were developed at Maribyrnong that were powerful, more compact and that could be used with commercially available gases at moderate voltages and with new optical components to suit the new lasers. In the 1970s, scientists at Maribyrnong designed, built and operated the first electron-beam-controlled carbon dioxide laser, the first continuous wave laser operating at atmospheric pressure and the first laser using plasma injection. When new facilities were opened at Maribyrnong in 1985, the laser installed in the new building was twice the strength of any industrial laser then in operation in Australia. In the 1990s, the Co-planar Pumped Folder Slab (CPFS) laser, based on laser-diode pumped solid state laser technology, was invented, patented and developed by Defence scientists Dr Jim Richards and Alasdair McInnes. The laser was licensed for use in the improved Laser Airborne Depth Sounder (LADS) that has since been marketed worldwide. The CPFS laser has many and varied applications in defence, industry and medicine. One of its key features is versatility, in that it can be arranged to emit continuously, or in short pulses (a few billionths of a second), in the infrared, visible or ‘eyesafe’ regions of the spectrum, offering state-of-the-art performance with only minor changes to the configuration. More recently, researchers at DST and the University of Sydney have developed a fibre laser that has greatly exceeded previously published power levels, and at the same time has set new efficiency records. The demonstration of such a simple and efficient technique is a significant advance towards development of a new class of smaller, lighter, cheaper and more powerful mid-infrared sources crucial to applications such as infrared-guided missile countermeasures for aircraft protection.